Mix the marinade ingredients into a freezer bag (oregano, garlic powder, olive oil and pepper). Place the chicken breast into the marinade, seal and set aside. In a medium bowl add all the ingredients for the salad, the lettuce mixture, cucumbers, tomatoes, avocado, and raspberries. Toss gently and set aside. Preheat a grilling pan on medium heat. Once the pan is hot enough place the chicken breast into the pan. Cook for 5 minutes on one side and then flip and cook for another 5 minutes or until chicken breast is cooked thoroughly. 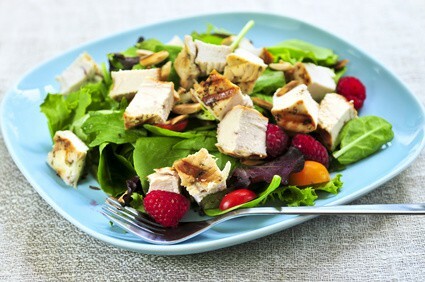 Slice the chicken into bit size and place on top of the salad mixture. Add your favorite low calorie salad dressing.